For the past three years, I have taught Primary in my ward. I was first called as the Sunbeam teacher in 2006, and my class consisted of four little 3 year olds: Elijah, Brigham, Iverson and Maria. They had been attending primary for several months without a regular teacher, so they hardly knew what to expect. Plus, they were accustomed to Nursery where they got to play for 2 hours and be treated with a snack every Sunday. After our little bunch formed we had a few regular occurances. One little girl cried every Sunday; fortunately, she later got to the point where she only cried if I wasn't there, and another jello legged little boy fell out of his chair every chance he could get! And of course, I loved them to pieces. The next year the children moved up to CTR 5, (CTR stands for Choose The Right) and since we had a good thing going I moved up with them. I was elated! Being older, we were supposed to cut out the snack portion - but along with my counterparts, I never quite accepted that guideline. We often had visitors in our class, Ian, Zack, or Noah, and finding a regular Sunbeam teacher still proves difficult so Shannon and Ellie joined our class on occasion. This year, I moved up again to CTR 6 with my original four kids but our class was combined with all of junior primary ages 4-7, (with the exception of Sunbeams) so our numbers often exceeded our regular 8 class members not to mention visitors and the sometimes frequent Sunbeams. "Why do we have to do this every Saturday night in the middle of the night?" "Because," I answered. "That's when it comes to me, I can't help that I get my inspiration at the last minute." I checked at Desert Book, but nothing seemed right - not to mention cost a fortune! They do have adorable puzzles with a picture of Christ blessing the little children, and you can write a message on the back that they can read after they put the puzzle together, but they only had 1 in stock. 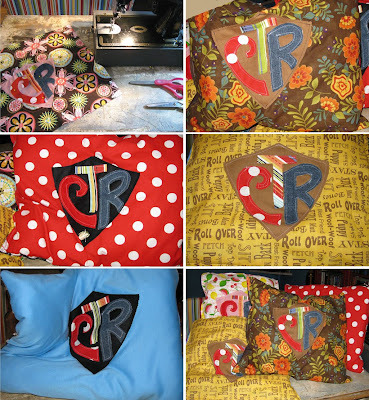 My inspiration: CTR pillows!! Now, I am certainly no master seamstress, but in this case I don't think it mattered one bit! I got the pattern from my Primary Lesson Manual - sort of. I took the CTR badge and enlarged it 150%. I cut out the shield and used it as my pattern for the base. 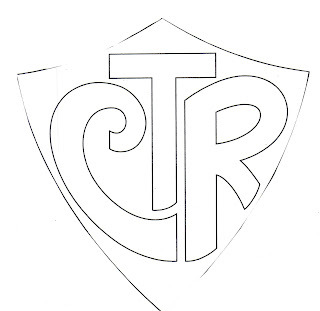 Then I cut out each individual letter and used those as a pattern for the CTR. That is where I solicited my husbands help; I owe a huge thank you to my wonderful husband! I could not have finished those before Sunday without him, and you'll see below how adept his cutting skills are! As I mentioned before it was 10pm when I got the idea - so I simply stitched atop each letter around the edges, I've used this technique before and I actually really like the effect. And since I didn't have the time to hide all the seams, I simply sewed the edges on the outside of the pillow deepening the impression of the CTR. They aren't perfect, but I just loved them, and my kids seemed to feel the same way! Then of course we celebrated with Peppermint Bark - the easiest Christmas treat! Line preferred pan with wax paper and coat with a very thin layer of butter. Melt dark chocolate to spreading consistency and spread over wax paper to line bottom of pan. Allow to set in fridge until hardened. Melt milk chocolate to spreading consistency and spread over dark chocolate. Crush peppermint candies/candy canes, your choice, into tiny pieces. Melt white chocolate to spreading consistency and spread over milk chocolate. 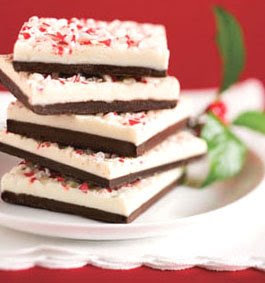 Immediately pour peppermint over white chocolate so that it can set into chocolate. Next year, I'll be ringing in the new year as Sunbeam and CTR 5 teacher (Sunbeam teachers are hard to come by). I am looking forward to it; I'll have two children that I frequently taught this year, plus the younger sister of my crier, and the younger brother of Mr. Jello Legs. Gotta love the late night inspirations! What a wonderful gift! I bet the kids love them! Kudos. CATHERINE!!! you are AMAZING!!!! i wish we lived closer! seriously, i would RUN over at 11 pm and HELP YOU OUT!!! AHH! what an AMAZING gift!!! you are so thoughtful! seriously, i am sure they are heartbroken to lose such a WONDERFUL teacher as yourself!! THANKS FOR THE PEPPERMINT bark recipe! YUM YUM YUM! you are the BEST! DELICIOUS! you are soo awesome! Sweetheart husband too! way to go gabe! soo nice! I am in LOVE with these pillows! !